OS grid reference: NM 6302 0964. The little Scottish island of Eileach-an-Naoimh (Rock of the Saint) is one of the Garvellach Islands, in the Firth of Lorne, and is the reputed burial place of St Eithne, mother of St Columba, making it a ‘holy island’. On this very remote, windswept island are the scant remains of a Celtic monastery with beehive huts, two chapels and a graveyard with three crosses, and 80 metres to the south-west is the traditional site of St Eithne’s grave, which is marked by a grave-slab bearing an incised cross. In old texts the island was called Hinba. And to this little island St Columba and other ‘saintly’ figures came from time to time for a deeper solitude and contemplation – this fact being borne-out because the island was, and still is, largerly inaccessible. There are no ferries or steamers alighting in Port Cholumcille, but some pilgrims do visit the island and pay their respects at St Eithne’s grave, though they have to hire their own boats! The island of Mull is 6 miles to the north and Scarba 4 miles to the south-west, while the mainland of Argyll is 6 miles away. Author Reginald B. Hale in his work ‘The Magnificent Gael’, tells us that: “Eithne came of the royal line of Leinster kings. Her husband Felim macFergus was a chieftain of the dynastic family of Ui Neill, heirs of the mighty Niall-of-the-Nine Hostages, High king of Ireland. So their little son was born a prince of the Blood Royal and would inevitably live his life in the glare of the political limelight. His parents had every reason to hope that someday he might hold the scepter of the High King and reign at Tara. But we know that Columba was born beside Lough Gartan in Co Donegal (521 AD) where there are the Medieval ruins of what is locally called St Eithne’s Convent. And there is a St Eithne’s Well at Termon. The site of St Columba’s birth, near the southern shore of the lough, is marked by the so-called ‘Natal Stone’, and nearby are the saint’s holy well, the Stone of Lonliness, and the saint’s ruined church. His birth was miraculous we are told. St Eithne had a dream in which she was given a beautiful robe with colours similar to the wild flowers, but the wind blew the robe away. However, the wind-blown robe grew in size and spread out to cover the land, mountains and islands – this being a sort of divine portent regarding her son who would eventually take Christianity to the northern Pictish High King, Brude, and his people sometime after 565 AD – at a time that was “dark” in many respects, but for St Columba it was a time of ‘great joyfulness’. In 563 AD Columba set sail for Iona and was accompanied by members of his family including his mother and also disciples and servants. Later, he founded a great monastery on the island which became a college of learning; he took the message of Christ to the Picts and established many other monasteries and churches in Scotland. His mother retired to the Island of Hinba (Eileach-an-Naoimh) where she was cared for by Ernan, who was St Columba’s uncle and also prior of the monastery of Hinba, founded by St Brendan. Women were not allowed in the monastery. St Eithne died and was buried on the island in the mid to late 6th century. Her ‘reputed’ grave is located on the Peak of Hinba, 80 metres south-west of the monastery, where a circular enclosure (11 feet in diameter) with three standing stones marks the site, one of these being a grave-marker (2½ feet high) bearing a thin equal-armed Greek cross with terminals, beneath which is a thinner spike. And there are a number of recumbent stones and a kerb running around the site. The grave seems to be positioned so as to look out over the Firth of Lorne. But some historians question the grave-site. A few think that it may in fact date from the Iron-Age, or earlier, and others think it may be the burial site of more than one person? But I think it should be pointed out here that the type of burial that was around in prehistoric times was more than likely to have existed well into the early Christian period – the so-called Dark Ages of the 5th-7th centuries AD. Monastery Chapel, Eileach an Naoimh by Gordon Brown, Wikipedia. 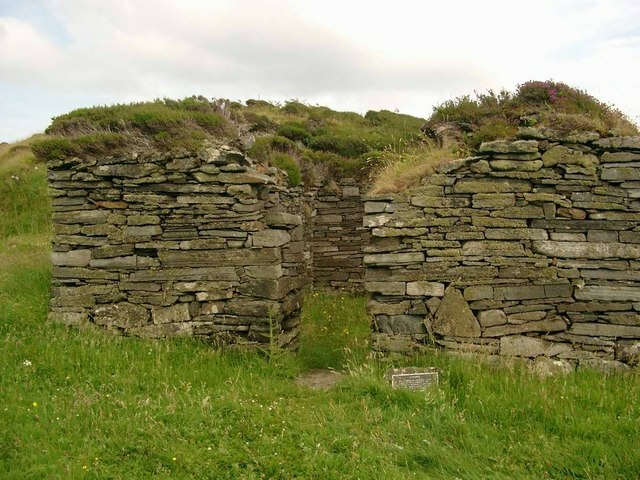 The monastery on Eileach-an-Naoimh often ascribed to St Brendan, rather than St Columba, is a ruin consisting of low drystone walls with a number of bee-hive huts (hermits cells) around it, one of which is a double construction. There are two small ruined chapels that are said to date from the 9th-12th centuries and a graveyard with three stones bearing incised crosses, and also a circular feature that is probably an early Christian grave, maybe that of Ernan the first prior? The monastery was probably burned c 800 AD and thereafter it suffered from a number of attacks by invaders from overseas, including the Vikings. 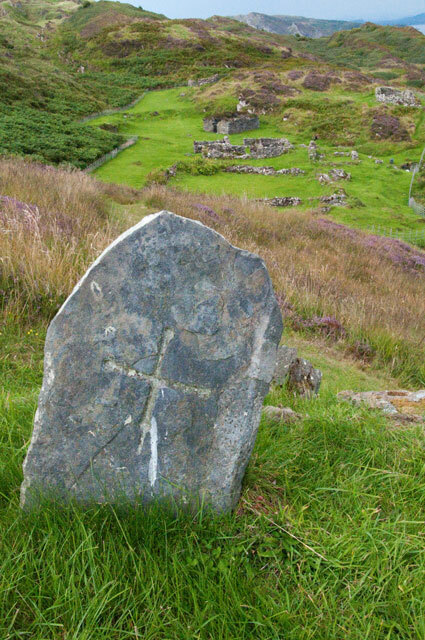 The monastic site on Eileach an Naoimh is probably the oldest religious ruin in Scotland. Hale, Reginald B., The Magnificent Gael, R.B.Hale, Otawa, Canada, 1976. Newton, Norman., The Shell Guide To The Islands Of Britain, David & Charles, Newton Abbot, Devon, 1992. The AA, Illustrated Road Book Of Scotland, The Automobile Association, 1963. Categories: Ancient Crosses, Inscribed Stones, Monastic Sites | Tags: St Eithne, St Eithne's Grave on Eileach An Naoimh in the Inner Hebrides | Permalink.